Indoor Environmental Consultants (IEC) provides air quality testing and consulting services for residential and commercial properties across Texas and the Gulf Coast. To help ensure that newborns and children of all ages are exposed to healthy indoor air, the environmental professionals at IEC offer testing and consulting services to identify pollutants, allergens, irritants and other potential hazards. According to the Texas Department of State Health Services, nearly 400,000 babies are born in the state each year. For the soon-to-be parents of these newborns, one of the primary tasks they need to accomplish before the birth of their child is getting the nursery ready for the new edition to the family. As parents shop for baby clothes, furniture and accessories, and begin decorating the nursery for the new arrival, the health and safety of the room’s future occupant needs to be of the outmost importance. 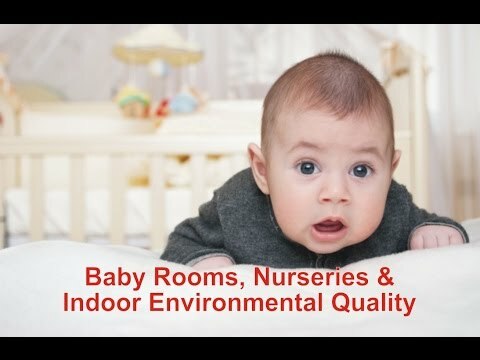 Newborns and young children spend so much time in their rooms that a critical component of their health and safety includes the indoor air quality (IAQ) and indoor environmental quality (IEQ) of their nursery. There are a number of common pollutants found in many nurseries that can cause potential concerns. Activities such as painting a nursery can lead to high levels of airborne chemicals known as volatile organic compounds (VOCs). New baby furniture can also off-gas VOCs from their components, paints, finishes, adhesives and glues and some manufactured wood products are also associated with high levels of formaldehyde. To help ensure that newborns and children of all ages are exposed to healthy indoor air, the environmental professionals at IEC offer testing and consulting services to identify pollutants, allergens, irritants and other potential hazards. These services include testing for VOCs, mold, bacteria, dust mites, lead-based paints, asbestos and other potential concerns. To learn more about IEC’s air quality testing and consulting services or other indoor environmental services, please visit www.iecinc.net, email ncancino@iecinc.net or call (877) 432-8378. About Indoor Environmental Consultants, Inc.
IEC began operations in 2001 with some of the nation’s most seasoned professional indoor air quality consultants who already had over 70 years of combined experience. The indoor environmental quality firm specializes in field investigations and assessments of commercial, institutional and residential buildings. Their services, related to fungal (mold), chemical, bacterial, asbestos and particulate pollutants, are offered throughout Texas, the Gulf Coast and the Southwest. IEC is licensed by the Texas Department of State Health Services as a mold assessment company (ACO0114) and an asbestos consultant agency (100329).